Are Christian Video Games Commercially Viable? What Is An Ebenezer Anyway? 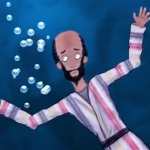 As regular readers of this blog will know, the working title of my Christian video game is “Ebenezer”. But what exactly is an Ebenezer? 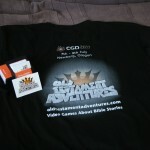 In preparation for this year’s Christian Game Developers Conference, I ordered a T-shirt and some business cards to advertise my Christian video game, Ebenezer. Well, yesterday they both arrived in the post – exciting times! 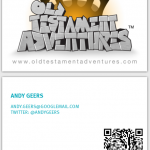 It’s not only promotional T-shirts I’ve been ordering for this year’s Christian Game Developers Conference – naturally, I’ve also ordered a bunch of that all-important networking tool, the humble business card.